Belfast airport parking can be either on-airport or off-airport. Go to courtesy coach pick up point for Courtlands coach. They run every 20 min's on a 24 hour basis. Follow signs for “arrivals” then go to reception, where car will be checked in and keys taken. We are certain that with our price match guarantee you will find the best possible price for your Belfast airport parking. Belfast Airport provides a wide range of facilities including those for business, children and the disabled. Public transportation to and from the airport is reliable and frequent with a choice of trains, coaches, buses, taxis and car hire. 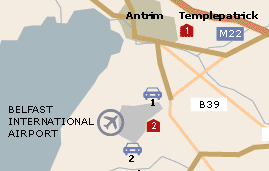 Belfast airport has one terminal which over 4 million passengers pass through each year.